UK-based film distributor Arrow Video (US office in Pottstown PA!) has done a wonderful thing. 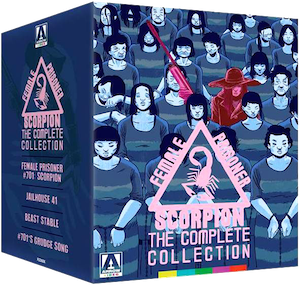 Thanks to their Criterion level treatment and design, the beloved and reviled Female Prisoner Scorpion film series is now unleashed upon the western world. These four foul-mouthed, ferocious and influential films have been carefully restored in 2K resolution with prints struck from Toei’s original 35mm film elements, and surrounded by substantive supplemental materials produced by Japanese film scholar Marc Walkow (read his piece on Lady Snowblood here, another revenge series starring Meiko Kaji). Arrow Video’s thoughtful supplements are more than mere garnish, enlightening to the expert and to the newcomer alike. My grand procrastination in exploring FPS turned out to be a blessing all these years. Through Arrow Video I was poised to appreciate these works of artful transgression at maximum capacity and in pristine form. FPS represents an arthouse high-point in the female prison exploitation sub-genera. Across four features, FPS varies the theme of women navigating pervasive persecution, and dissects the complex sororal bonds that are made and unmade in the shadow of such persecution in the pressure cooker of prison society. 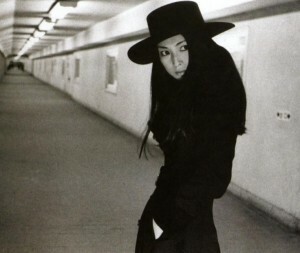 These are highly physical and tactile films that dwell on the curse that is having a body, such that the violence is often unbearable and always primal (queue Meiko Kaji running madly through the streets with the detective’s arm she severed still handcuffed to her). In the seminal Female Prisoner #701: Scorpion, Nami (played by a quiet and relentless Meiko Kaji) is scorned by her detective boyfriend and imprisoned for a crime she did not commit. This is the seed of her controlled inner rage. Thereafter she is thrust back and forth between prison and the outside world, fight and flight, victimhood and vengeance like a silent needle threading her unhappy path. Her intensity earnes her the name Sasori (Scorpion). She hones her survival with calculation and reserve and exacts her vengeance in strategic bursts. Always a woman apart, watchful and animalistic, brutal and resilient yet somehow frail she presses on. 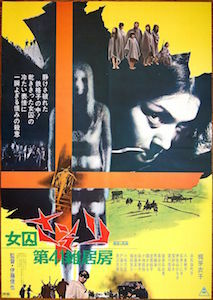 Shunya Ito, director of the first 3 Scorpion films (of which the first was his own debut), exhibits stunning visual invention that draws as much from the graphic source material as it does from Japanese theatrical forms such as Noh, and Butoh, that enhance the vivid nightmare that is each frame of the series. His cinematic ideas throughout, elevate the series into art. The dual-format FPS box set is exciting both inside and out. As an artist I am thrilled by its loud illustrative focus (a heavy nod to the fact of the manga source material). The sturdy compact set contains 6 discs (a bluray and dvd for each respective film), 4 reversible disc jackets, a full size reversible film poster, a hardcover booklet featuring essays and interviews (including a very candid and valuable interview with star Meiko Kaji) printed on beautiful matte finish paper. In an age where the nature of film/media ownership is in flux and trending digital, this box-set deserves to be an object, and is a desirous one at that..
As mentioned, supplements are all focus and no fluff. Among the most compelling are the interview with Production Designer Tadayuki Kuwana (whose influence laces every image), and the appreciations by critic Kier-la Janisse and Gareth Evans, who delve into the exceptionally difficult misogyny and female-directed masochism that is inversely the bedrock of the series’ feminism. FPS paints a perverse portrait of an abusive patriarchy that extends all the way up the corrupt rungs of the law. Ito goes so far as to censure Japanese nationalism as a host to that corruption through visual language. As challenging as it is to endure the staggering brutality heaped upon so many women, it is clear that the FPS films lament rather than rejoice in such suffering. FPS creates a morbid transfixion through framing and color, by centralizing the interior strength of its protagonist, and using exploitative genre elements as skeleton to social, political, and cinematic ideas. To present such content for the sole purpose of exploitation would have been sheer snuff, but Ito’s intelligence and empathy are revealed in the details. To not have discussed this content in an analytical way would have been a grave misstep, but Arrow keeps it real. You can purchase FPS on amazon!